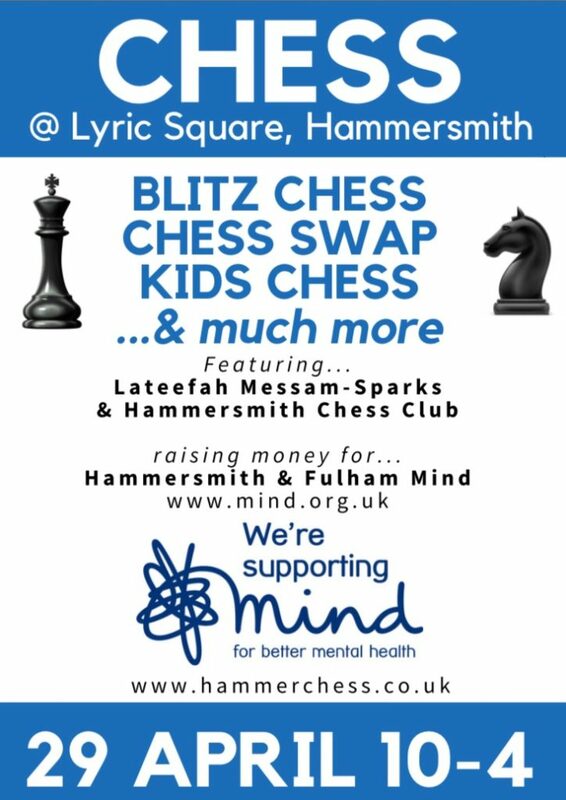 Firstly – you will hopefully all be well aware that we are going to be in Lyric Square, Hammersmith town centre this coming Saturday 29th, from 10.30am to 4pm, playing chess and having lots of fun in aid of a fantastic cause – supporting Hammersmith & Fulham MIND, a mental health charity. The response from members has been great and we’ll be out in numbers, with lots of people volunteering for the whole day alongside other members who’ll be turning up throughout the day. If you don’t already have plans on Saturday, come down and join in! We’ll be playing games against the public, Phil is organizing some Chess Swap(! ), we have the fabulous Lateefah Messam-Sparks with us – she’ll be organizing some events with children, and there may even be a simultaneous in the mix. Spread the word, and come on down!! 26.04.17 – London League 3 Update: Hot off the Press!!! My fellow Hammerites – sensational news that Hammer 3 has retained Division 3 status in the London League! Objective for the season achieved with one game still to go, and despite the loss of half a match point due to defaults. I want to thank all the players who turned out for the team this season. This is all down to you and the great esprit de corps that runs through our chess club. Yet, in the midst of it all there is a slight tinge of regret. Hammer lost so many matches by the odd point/half-point, and if the roll of the dice had been different we would be in a real promotion battle. We lost 5 matches by 0.5 or 1 point. With the exception of the first match of the season against Cavendish we were very competitive, despite being outgraded on many evenings. The truth be told, the margins between where we ended up and where we could have ended was very fine. It came down to maybe seven individual games over the season. This gives us real hope for next season and achieving promotion to Division 2 as a realistic goal. Roll on 2017-18 season, and go Hammer!!! History is said to repeat its lessons on the inattentive or unprepared. Yes, the result was a repeat of our last score against Greater London, 1.5 – 2.5 back in October 2016. The only consolation is that our opponents had some 40 points over us in grading points across 4 boards this time around. Board 4 with the white pieces saw Chris opening with the English and an early Rook to Rac1 in itself, a good omen actually. Suddenly white had trapped his opponent’s Queen on the a-file and resignation followed. Chris has a daunting attacking style with lightning moves one after another. Well done Chris! Board 1 saw John Woolley with a super-sold Sicilian and a draw agreed, when no pawn break could be attempted. The captain, black on board 3, had no real opening that could be recognized against standard 1.e4, perhaps the point of it, as it all came down to skill rather than opening knowledge… After an early sally on the castled King, black was unable to maintain pressure, and after trading Queens with Knights, with a view to setting a trap that white easily circumvented, black ended up with 2 isolated pawns and one doubled-pawns – not lost, but not very pretty. The game became a four-a-side football with 2 Bishops and 2 Rooks opposing each other. With play on both sides, the middle game could have gone either way. White’s dawn raid became inevitable and he launched a Rook on the 7th, supported by 2 Bishops mating attack. Black loses a Rook to avoid the mate. Enter white’s e-pawn into the field of carnage, which is pushed to the 6th… leaving black with no option but to capitulate. David on board 2 had an advanced variation of the French to deal with. On the face of it, white had a nice pawn centre up to the 5th with the e-pawn on point. White seemingly had an advantage, but not sustainable. After simplification to a Bishop versus a Knight, and many pawns, the ending became highly technical, with a draw in the offing. After board 3 went down, however, David surrendered also, material down. Congratulations to Chris on a magnificent win! I wish I had a draw in the offing. Alas, Fritz was not so generous. Despite being just a pawn down, it had me at about -4 at the time..! Frustrating match for me. Previous Previous post: Shootout at the Wheatsheaf Corral!